Rosie Pope: Pregnant in Heels or Pregnant in Flats? Yes it's true my show on Bravo is called Pregnant in Heels! So everyone assumes I am ridiculously passionate about pregnant women wearing 4" platform pumps around town attempting to balance their growing belly, trying to avoid every pot hole and every subway grating that comes under their footing. Well, that isn't exactly the truth! What I am passionate about is pregnant woman feeling good about themselves and sometimes that means throwing on a good pair of heels...but only if you know how to walk in them in the first place! Pregnancy is not a great time to take up stiletto wearing especially as your center of gravity starts to shift and you are much more prone to aches and pains in the back and pelvic areas. However, if you are a high-heel pro then by all means wear them, but wear them in moderation. Part of becoming a parent means being able to exercise your common sense and trusting your instincts so if it's raining out, you keep stumbling and your back is hurting, it's probably time to kick the heels! If you don't have to wear them for very long and have a car waiting for you to chauffeur you to your event (ahem Kim Kardashian), then go ahead, rock the heels! Or, my favorite: Wear some wedges; they are a great alternative in this great debate! 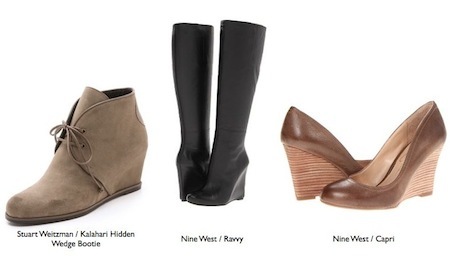 Wedges provide the height that can make you feel elongated and better about the way you look, but also a little more support than your spikey stilettos heels. As with everything fashion, pregnant and parenting related, there are many people that will support what you do but there are just as many that will judge. The amount of negative comments I read when Jessica Simpson or Kim Kardashian stepped out, pregnant and in heels was overwhelming. The fact is though, that these are grown women about to be mothers and we have to trust they are at least able to make an educated decision about whether wearing heels to an award show or not is a good idea and lay off the judgment a little. Besides, they are not schlepping through the subway or walking great distances in these heels; they have chauffeur driven cars at every turn and usually a handsome partner to lean on! After all, they will have far more difficult decisions to make along their road to parenting, let's hope at least they are making this one correctly! The shift in center of gravity during pregnancy and the lack of stability in heels means you can be prone to falling over. In attempting to keep balanced, there can be excessive strain put on the ankles and other areas of the foot leading to further swelling and possible muscles aches. Severe back pain can be caused or exacerbated by the posture created while wearing heels. Sciatic nerve pain during pregnancy is extremely uncomfortable. Wearing high heels can actually worsen the condition. The Sciatic nerve is a long nerve that starts from the lower back through the back of legs, all the way down to the feet and the wearing of heels can cause additional pressure to be put on this nerve. Ironically however, standing on your tip-toes can sometimes relieve sciatic nerve pain and I personally have had to walk on my tip-toes in order to get through some bouts of extreme pain.